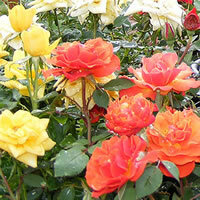 Like so many varieties of roses these days, mini roses have a muddled, and much sorted history. A history that is often disputed and contradicted from rose authority to another. No one really knows the origins of the first true mini roses, however there are several suspects that always come up in the discussion as potential originators. One such rose is the R. roulette, which was given its name to honor the individual who is credited with having discovered the tiny rose in Switzerland. The problem with tracing these origins is the records we do have on these roses contradict one another. For instance, the European variety of the R. roulette is much different than the variety that was cultivated and sold under the same name here in the United States. The Europeans call the larger variation by the name Pompon de Paris. Another possible candidate for the origin of miniature roses is the Lawranceana. However this particular rose is disputed in some circles as being nothing more than a renaming of the Cloire de or des Lawrence and R. chinensis minima. Where one botanist will claim a particular rose has never grown in the wild, others will trace it back to China with a rich history of thousands of years of cultivation. While we may not know the parentage, we do know that the offspring of these roses have formed the foundation of just about every one of the miniatures that we have in the modern day. In spite of the discussion regarding their origins, we have literally hundreds of roses available today that are classified as miniatures. 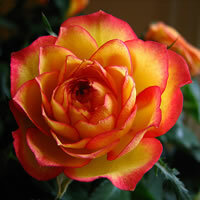 A great many of them are simply smaller versions of their parents and introduced as a whole new rose. No matter what your tastes are, you can find one of these little gems to suit your garden or patio. There is even a relatively new class of these roses that grow 6 inch in height or less, and they are considered micro-minis! In general however you will find most miniature roses to grow upwards of about 2 feet tall or so and produce blooms that range from the size of dimes to that of quarters. These dwarf versions of their larger cousins are ideally suited for gardeners who enjoy growing container plants. Growing your miniatures in containers certainly opens up a lot of possibilities that you don’t have available with traditional roses, however like their larger kin, even the smallest of roses need a lot of sunlight to perform well. Try to give them at least 6 hours or more of direct sun light each day. You will also need to rotate your containers weekly or bi weekly, to encourage the plant to grow evenly on all sides. The guidelines for caring for these types of roses vary greatly from those you might plant in the ground. Since we already spend a great deal of time in the other articles discussing outdoor planting and growing, we are going to focus more here on growing your dwarf roses in containers instead. 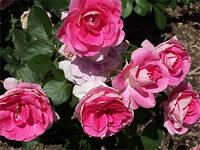 Growing roses in containers requires you to be much more diligent and consistent in your care. 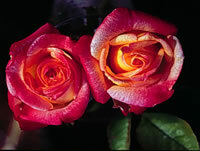 For instance container roses need to be watered more frequently. A good rule of thumb here is to water them thoroughly when more than the top inch of soil becomes dry. You should soak the soil well, allowing it to run out the bottom of the container before stopping. Even once you stop the flow of water, the excess will continue to drain out. Once the container is done draining, do not allow it to sit in standing water. This is a common mistake among many growers. You will also need to feed your miniature roses more frequently when blooming, however be aware that over fertilizing may cause your plants to grow rampant, but it will also likely inhibit the blooms. One application per month during the bloom cycles should be a sufficient starting point for most varieties. While you can certainly grow your little roses inside, they will love it if you give them the warmer months outdoors as well! Just make sure you take care not to expose them to the harsh elements too quickly after keeping them indoors for the cold winter months. You can set them outside after all danger of frost has past, but start them off in a shaded location for the first 2 weeks. This will give them time to acclimate to the new environment and then you can set them into their sunny location for the duration of the growing season. Growing your miniature roses outdoors will make them vulnerable to pests such as spider mites and aphids. There are various products available commercially that you can spray on your roses to help keep these at bay, however if you do not want to use chemicals on your roses, you can mix 1 tablespoon of dish soap into a quart spray bottle of water and use that instead. Soapy water will not harm the plant and it is usually a good deterrent for these insects. 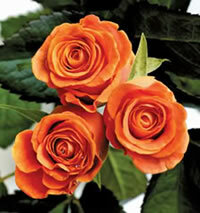 Pruning is essential for these roses, just as it is for most other classes of roses. When the blooms begin to fade, cut them back and remove any yellowed leaves or branches that are dead or dying. You can also use this time to remove the canes that just aren't performing well or look spindly or weak. If canes are not doing well, they are doing little more than blocking sun light from the healthier canes so it's ok to remove them. Winterizing your roses is easy if they are in containers, however if you planted your mini roses in the ground, make sure you give them a good layer of mulch and in some cases even covering them is suggested. There are several types of small hoop house designs you can implement for this purpose.